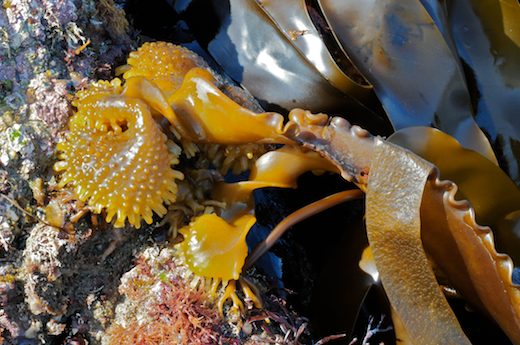 Description: Thallus laminate, yellowish to dark brown, generally to 3 m long; holdfast large, hollow and covered in smooth warts (below, bottom; thus "Sea Hedgehog") when mature, giving rise to a flattened oar-like stipe with beautifully symmetrical frilly "wings" (below, left and right) with a single twist at the base. Stipe forming a single digitate fronds with irregularly lacinate "digits", these are dotted with groups of hairs. Habitat: lower intertidal and shallow subtidal. 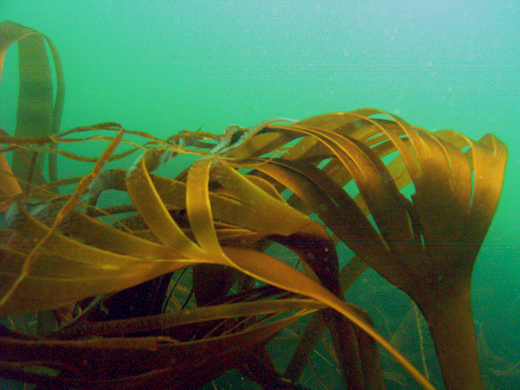 Generally filling in "holes" in shallow-water Laminaria digitata forests. 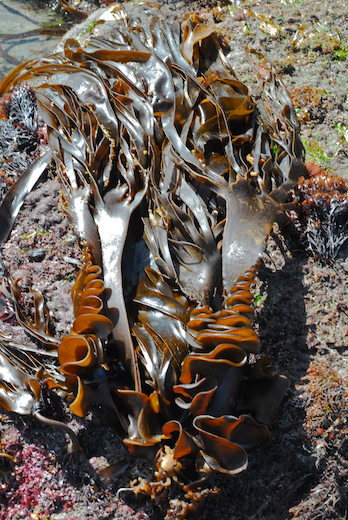 This is an annual kelp, essentially an opportunist that colonises any vacant space in the forest, but cannot compete with the dominant species. 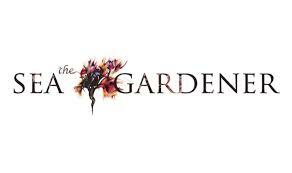 Distribution: widely distributed in Britain, Ireland, France, Spain and Portugal. South to the Canary Islands, Morocco, Ghana and Mauritania. Key characteristics: Hedgehog-like base (absent in very young plants), flattened oar-like stipe with frilly edges at base. 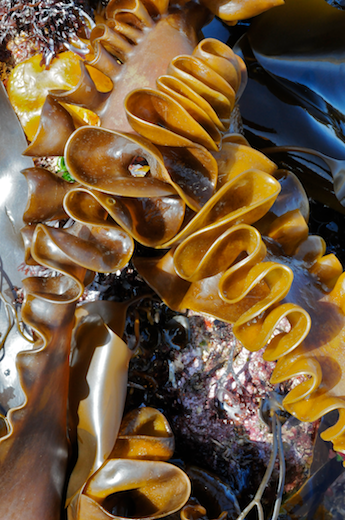 A flattened stipe of this kind is not found in any other kelp. Site © M.D. Guiry 2000 - 2019. Important copyright notice: all text, design and photographs on this site are copyrighted by M.D. Guiry unless otherwise stated and all rights are strictly reserved. Click here for copyright information and contact. Website design: 249 Design Studio. Site maintained by M.D. Guiry (michael.guiry@nuigalway.ie). There have been 8736716 page loads since 1 January 2014 on 25 April 2019.